A bike lane on a busy Waterloo street is raising red flags for cyclists. The space in question is on Northfield Drive West near the expressway, a very busy stretch of road that has some cyclists worried for their safety. “You have the ION coming right up through there, and there’s a station for the ION, there’s a cycling lane, you have an on-ramp onto the expressway, and all of those cause distractions for the drivers,” explains Doug Cota, who owns nearby Waterloo Bike Shop. He says that visibility for cyclists is already limited, and these other factors can detract even further from their safety. The concern sparked when a social media post began circulating showing the bike lane and cars driving through it. The road hasn't been brought to the attention of the region. “In particular, this location has not been identified as a problem,” says Bob Henderson, manager of transportation engineering with the region. Henderson says that it’s everyone’s responsibility to share the road. Still, some cyclists say that cars ignore the bike lane altogether to get onto the expressway, often going faster than the posted speed. 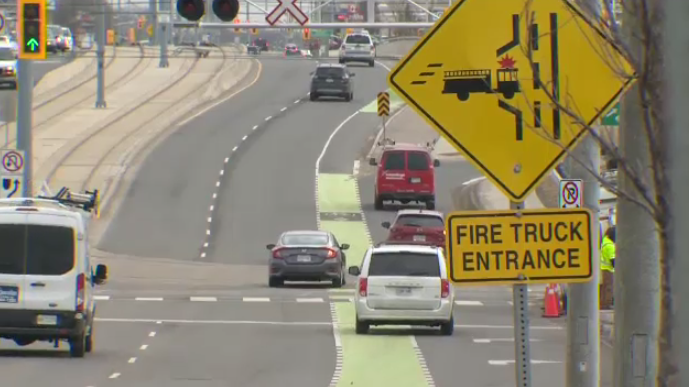 Cyclists are concerned over the safety of a bike lane on Northfield Drive West.